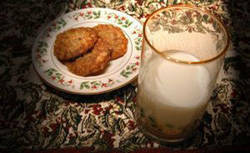 Serve these healthy and delicious oatmeal cookies that the entire family will love. 1. Preheat oven to 375 F. Combine baking soda, salt and flour in a bowl and set aside. 2. Beat butter, granulated sugar, muscovado and vanilla extract until creamy. Beat in eggs. Gradually beat in flour mixture. Stir in oatmeal. 3. Use a tablespoon to scoop out the cookie mixture onto un-greased cookie sheets. Bake nine to 11 minutes or until the sides are golden brown. Let stand for 2 minutes on cookie sheets then remove. Cool. Good for 1 ½ dozen cookies.